No other European country has a more diverse history of emigration than Great Britain. Besides the “usual” emigrants during of the 19th and early 20th centuries there were the early settlers in the 17th century to North America, the establishment of colonies around the world, the shipping of slaves to those colonies as well as the transfer of prisoners to Australia. Already in the mid 16th century the British crown sent explorers to the New World. However it took a few more decades for the first successful and permanent English settlement in the US to be established in Jamestown, Virginia in 1607. The first elected president of the Virginian Colony, John Smith, quickly began exploring the New England territories as more and more adventurers, merchants and also persons fearing persecution for religious beliefs were attracted by this venture. Probably the most famous arrival was that of the Mayflower in 1620 with 102 English Puritans who had lived in Holland prior to their emigration. They settled in Plymouth, Massachusetts. But more than half of the group died within a year from disease or starvation. Over the next 10 years more than 700 Puritans followed them and also settled in the Massachusetts. John Winthrop, who arrived in 1628, became the first governor of Massachusetts Colony and he chose the city of Boston to be its capital. During the next decade over 20,000 people settled in Massachusetts. The new colonies in New England were the first penal colonies so that during the 17th and 18th centuries many thousand prisoners in England, Scotland, Wales and Ireland were sentenced to transportation to the colonies. Many of them also worked on tobacco plantation in Virginia. At the end of their sentences most of them were however not able to return home. This transportation of prisoners to America ended in 1776 due to the American War of Independence (1775-1783) of the 13 British colonies against the Kingdom of Great Britain. The early British arriving in America were referred to as colonist or settlers. The term immigrant was officially first used in 1787. 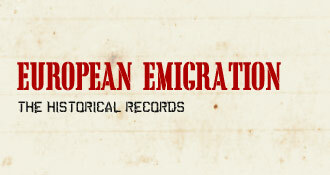 The emigration continued until the 20th century. From 1820 to 1920 over 2.5 million people emigrated from England to the US making it the fifth largest emigration nation following Germany (5.5 million), Ireland (4.4 million), Italy (4.2 million) and Austria-Hungary (3.7 million).